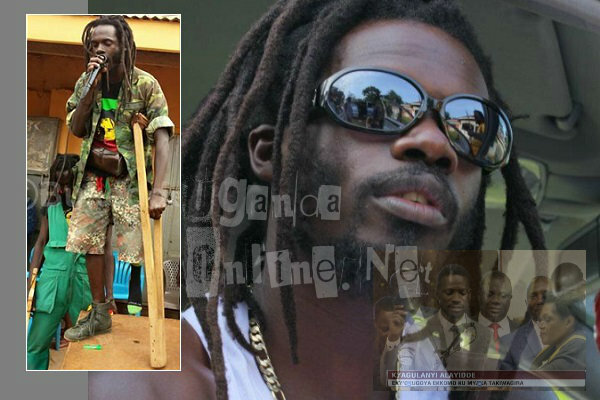 As Bobi Wine was swearing in as the newly elected MP for Kyadondo East, Buchaman overtook him and also swore in as the new Ghetto president..
Buchaman accused of deserting Bobi Wine's Fire Base Crew, but he claims that quitting the crew does not tatamount to qutting the Ghetto. "My father say there's more politics in the music industry than in parliament...." is a line off one of Bobi Wine's songs and the recent developments seem to suggest so. Blame it all on Bobi Wine's June 29 landslide victory, his Uganja Republic is now in a state of disarray. He is the Ghetto president, but his once vice president who was fired over indiscipline has now come out to claim he has overtaken Bobi Wine. As Bobi Wine was swearing in at parliament in Kampala, Buchaman was also in Nakulabye at one of the ghetto youth centers swearing in as the new Ghetto president. "Game over for dem, and am taking over. They can't manage, mi do it myself. Ghetto is Ghetto and Government is Government. So I Bucha Man stand fi di ghetto people dem." In his message, Bucha Man seems to suggest that Ghetto and Government don't mix and therefore Bobi Wine won't be able to juggle the two roles, he had better relinquish the Ghetto bit to him. Bobi Wine is yet to comment as he is still on holiday with his wife Barbie, in Malta, Italy. This did not go down well with Kabaya who very quickly convened another ghetto gathering and called for the arrest of Bucha Man to face charges of "treason," He ordered Micki Wine who is the Minister of Defense in the Ghetto government to hunt down the one legged star. Kabaya says is the legitimate vice president who is waiting to be sworn in when Bobi returns from Malta. What Bucha Man did was wrong and in the Ghetto circles, he is entitled to the 'Miggo Ntandalo' punishment which he went on to explain..Four people hold you, two by the legs and the other two by the hands and then the number of strokes you've been sentenced to are unleashed on your behind. Bucha Man was on Friday night appearing on Bukedde TV looking disturbed with whoever was trying to block his bid for the Ghetto president slot. "I've been a VP for over 18 years, so the time is now." However, some are of the view that it was Hon. Robert Kyagulanyi who was sworn in at parliament and not Bobi Wine the Ghetto president, so the situation still stands and no need for Bucha Man to be excited.